An attentive audience listens to what the options for higher internet service are, and how much it will cost them as taxpayers, at a January 23 meeting at Penobscot Town Hall. The members of the Internet Committee in Penobscot have a busy few months ahead, as they take on the task of bringing better internet service into town, ideally to serve each household in the community. A survey returned by 154 households found the majority of people in town, over 50 percent, were unhappy with their internet service, and that some did not have access to service at all. The town is currently served by Consolidated Communications. 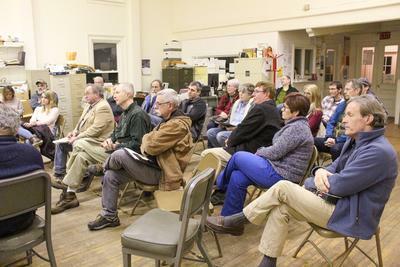 At a meeting on January 23 at town hall attended by over 30 residents, the Internet Committee, along with Mark Ouellette, president of Machias-based Axiom Technologies, talked about options for internet services, and the upfront costs to bring them to town. The cost of bringing in fiber cable, which would allow residents access to much higher speeds of internet, would be about $3 million, according to Ouellette. The money would come from various avenues, including town funding through taxation and grant funding at the federal and state levels. Wireless internet was another option Ouellette brought to the table, and he said that while it is cheaper, at roughly half the price of fiber, and provides sufficient internet speeds, the landscape of the town of Penobscot may not be suitable. “If you live in front of a hill, or in a dip, that could affect your service,” said Ouellette. “There are a lot of hills and tree cover in Penobscot, so while some people would have better internet, it probably wouldn’t work for a good majority of the population. Joel Katz, the lead member on the Internet Committee, explained that while the town has some time to make a decision, it is important to continue making momentum toward bringing higher speed internet to town. The committee decided to write a warrant article for town meeting in March, to ask the town to set up a contingency fund, which would be added to at each town meeting moving forward. Selectman Phil Rapp suggested $10,000, and to write the warrant article in such a way that the dollar amount could be changed up or down should attendees at town meeting wish to do so. “This at least shows that we are dedicated to doing this,” said Katz. Toward the end of the meeting, Chris Lynch of Matrix Design Group, who had been quietly in attendance, stood up and told the committee that his company would be willing to work with the town, and kick in $2.5 million of the $3 million it would cost to bring fiber to the town. He added that the town would be able to purchase the network after three years, and that the buyout cost would go down incrementally every year. Lynch, who is the Director of Business Development for the New England division of the company, said that his company has done several projects like this across the country. As far as a timeline, Katz said that it could take several years before things are completed.